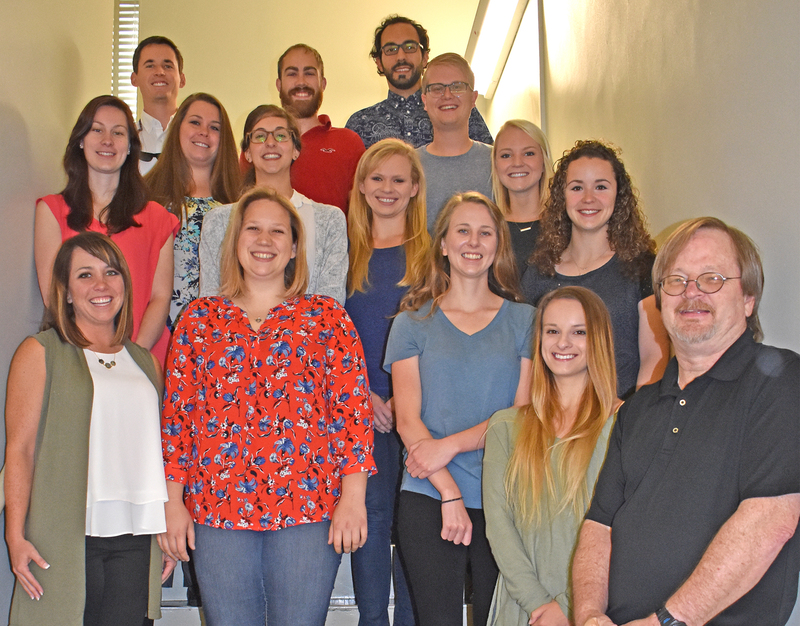 Among the 18 participants in this summer’s Boehringer Ingelheim Veterinary Scholars Program are: Front row from left: Sarah Excaro, Montgomery, Ala.; Brooke Alnwick, Groton, Ma. ; Sarah Christie, Birmingham, Ala.; Melissa Crepps, Cox Creek, Ky.; Caroline Parker, St. Louis, Mo. Middle row from left: Natasha Taylor, Richmond, Ky.; Amanda Hill, Plymouth, Ma. ; Sofia Castello, Spanish Fort, Ala.; Paulina Platten, Dallas, Texas; Katie Bello, Auburn, Ala.; Back Row from left: Brett Story, West Palm, Fla.; Trey McElroy, Kingsport, Tenn.; Carlos Lloveras-Fuentes, San Juan, Puerto Rico; Matt Miller, Bowling Green, Ky. Shown front right: Program Director Dr. Michael Irwin. Auburn University College of Veterinary Medicine faculty are teamed with 18 students this summer for the Boehringer Ingelheim Veterinary Scholars Program. Formerly the Merial Veterinary Scholars Program, its mission since 1999 is to provide a hypothesis-driven laboratory research experience for veterinary students. The 10-week program runs from mid-May through July and involves Auburn veterinary students as well as students from the Tuskegee School of Veterinary Medicine. “We also accept a small number of students from other vet schools,” said program director Dr. Michael Irwin, a research professor and director of the Transgenic Facility in the Department of Pathobiology. “We try to give preference to students who have not had any research experience, so lack of experience is actually a plus. Mentors and students are teamed through an interview and mutual selection process, according to Dr. Irwin. The program also includes seminars, journal clubs and field trips. “Seminars cover everything from safety and compliance in research to standard and cutting edge-research technologies,” Dr. Irwin said. Field trips this year include visits to the Southeastern Raptor Center, the state Diagnostics Laboratory and the Georgia Aquarium, where the students get a behind-the-scenes tour with one of the aquarium veterinarians. At the end of the program, a select few students will attend the national symposium at the National Institutes of Health (NIH) in Bethesda, Md., Dr. Irwin adds. Participating in the program for the second year, AU CVM student Melissa Crepps, from Cox Creek, Ky., says it is the research opportunity that attracted her. “Almost everything we do as veterinarians is based on previous research,” says Brett Story, of West Palm, Fla., who plans to become a specialist in veterinary neurology. “I hope to learn and see hands-on how we develop these new techniques, procedures, and medications that are utilized by clinician’s every day,” Story adds. Gaining more research experience in the area of dermatology is the draw from student Kimberly Smart, of Somerset, Ky.
Students are paid a stipend for their participation, Dr. Irwin said. The program is overseen by the Summer Research Fellowship Committee, and is administered by Dr. Frank “Skip” Bartol, Teresa Logiotatos and Amelia Pendleton in Office of Research and Graduate Studies (ORGS). “Amelia is indispensable because she handles all the logistics and makes sure that everything gets done on time,” Dr. Irwin said. Financial support comes from Merial (now Boehringer Ingelheim) and from several units within the college: the Dean’s office, Auburn University Research Initiative in Cancer (AURIC), ORGS, Scott-Ritchey Research Center, and the college three departments: Pathobiology; Anatomy Physiology and Pharmacology; and Clinical Sciences. The 18 veterinary students participating in this summer’s Boehringer Ingelheim Veterinary Scholars Program are paired with faculty-research mentors through an interview and mutual selection process to form strong mentor-student teams.